Devoted to a Rational Development of Man’s Capacities and Powers. The Promotion of Individual and Special Freedom, Opulence, Health, Happiness and Success. Omaha, NE. Editor: P. Braun, Ph.D.
1/1, January 1903-2//10, October 1904(?) $1.00 a year. 16-20 pp., 8 x 10. 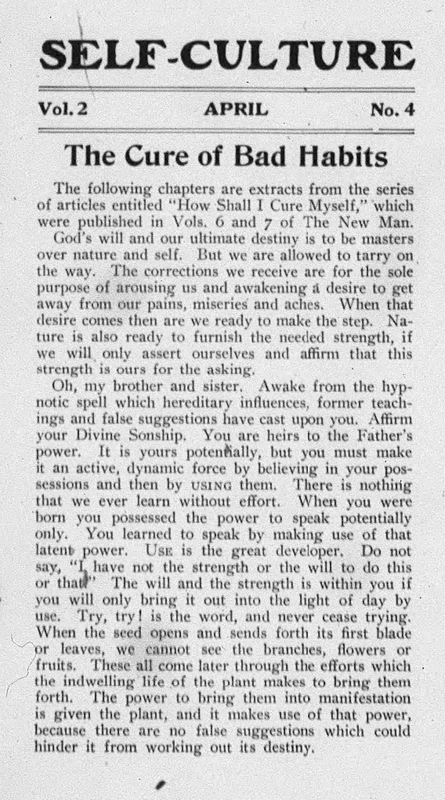 The content was largely "Dr. Braun's New System of Magnetic Healing," and, beginning with the issue of August 1904, the serialization of "Ancient and Modern Magic," both of which later appeared in book form in English and German. The journal carried advertisements for several like-minded New Thought mages and also, perhaps as an indication of Braun's financial straits, long advertisements paginated in the content for "A Safe and Profitable Investment" in the Oxarna Gold Mining Company of Custer, Idaho, which guaranteed a return on investment. On Parzival Braun, see the notes under The New Man, Der Meister and Christliche Theosophie. NYPL microfilm.